Spend a night enjoying the spectacular vistas of the Sacred Valley on a 2-day Skylodge Adventure from Cusco. Feel your adrenaline levels surge as you cross a vertiginous suspension bridge and ride an exhilarating zipline to the handcrafted aluminum pod in which your overnight accommodation awaits. 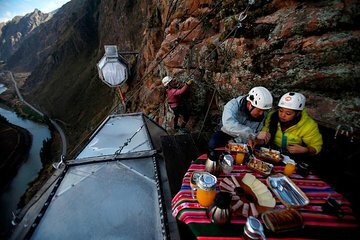 After enjoying a gourmet dinner accompanied by wine, settle into your comfortable pod suspended 400 meters (1314 feet) above ground and absorb mesmerizing views of the surrounding countryside.